You can get official news from the official site and twitter feed and see the trailer there or anywhere, so I wanted to wait until a nice amount of commentary showed up on the crazy Internet. There will be spoilers (nothing too major, I hope) pictures, GIFS, and embeddings of teasers real and fake, so don’t click that link if you have a slow connection (like me!) or want to avoid spoilers. It does indeed contain new music by John Williams, though it doesn’t sound very different (and I have no problem with that). I have to say that the most compelling shot in the teaser is John Boyega in the stormtrooper get-up, looking in a hurry and apparently terrified. For one thing, it gives me hope that the acting in this movie will actually be believable! Also pointed out to me were the probe droid sound effects, as if they are looking for Boyega’s character and causing him to panic. Of course that could just be filler sound effect and not really what’s worrying Boyega, but it works. I greatly wonder what’s going on with him, but it also raises many other questions for me. Are there many stormtroopers this long after Return of the Jedi? Does this mean that the Empire continued on and had a lasting influence, or was there just a small group of people trying to revive the Empire by dressing up as various types of Imperial military personnel? Was the destruction of the second Death Star merely the beginning of more wars throughout the galaxy, and not the start of a peaceful era that the end of RotJ implied (especially the Special Edition)? Is Boyega part of the Empire? Did he defect and get chased across the desert by probe droids? Did he not defect, but crash on Tatooine for some reason? Did Daisy Ridley’s character have something to do with this? Or does this imply nothing of the sort about the Empire or stormtroopers, or Boyega’s character? Is Boyega wearing a trooper disguise (not unheard of)? Did he merely lose his clothes and find nothing but an old stormtrooper outfit from the time the troops visited Tatooine over thirty-five years before? Did it belong to Mr. “Look, sir, droids!” Well, I have to congratulate Boyega for making me care using his expressive eyes and jawline. I don’t think we learned any more about Daisy Ridley’s character from this trailer, but it was nice to see her playing an active role and strongly resembling that concept art I gushed about previously. No doubt she realized she left the oven on and is hurrying back to the downed AT-AT where she lives. She seems to be in the same place (Tatooine?) as Boyega, which goes with the idea that they will work together as the leading protagonists of the movie (and possibly the trilogy). Is this where they first meet? Or do they already know each other? Does a romance develop? Or are they friends or relatives? Based on their similar ages and on the fact that both actors are from London, and might therefore sound alike if allowed to use their natural accents for the movie, it could go either way. The brief shots of (I guess) stormtroopers being deployed were probably the most “contemporary” looking parts of the teaser. I don’t expect cinematography like that in classic Star Wars. But that’s what this movie looks to be, a mixture of the 70s/80s movies and today’s. To whit, the rolling ball droid. I don’t know how that shot was created, but I could easily see it being done with far less CG than one would expect. I would love to know the droid’s purpose. I have heard (from the link at the bottom of this post) that the droid belongs to Ridley’s character. He is definitely Artoo style, visually and personality-wise. 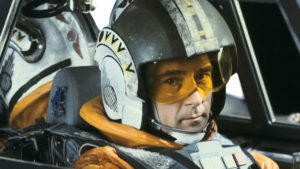 Unfortunately that’s not Wedge flying the X-wing, as Denis Lawson has declined to participate in the movie. I’m told that the actor is Oscar Isaac, who’s looking good in the new flight suit. Of course, the real question is WHO IS FLYING THE FALCON? It’s interesting that the “new” elements of the teaser are actors who have not been in Star Wars before, and the old elements are the starships. The X-wing reminds us of Luke Skywalker, and the Millennium Falcon reminds us of Han Solo, but we don’t see either character. Guess that’s a surprise for later. Also, apparently the Falcon‘s sensor dish got replaced after the battle of Endor. So we got plenty of (probably) Tatooine, but it looks like we have new locations! A lovely lake, and even lovelier snowy forest (we’ve seen snow in Star Wars, and forests, but at the same time?). Probably filmed on planet England, but I look forward to seeing some new star systems and planetary biomes — especially what Iceland is for. The shot of the (apparently Sith) guy with a red lightsaber is clearly reminiscent of our introduction to Darth Maul in the first trailer for Episode I, by way of his showing off his new design of his own Sithly red lightsaber. What is it with Sith and futzing with classic lightsaber design? Not that I’m complaining — it actually makes me wonder if deviating from Jedi traditions, and proudly showing off of same, is part of being a Sith. I’m certainly interested in seeing whether this new lightsaber with claymore-style hilt will have a function beyond looks, just as Darth Maul’s double-bladed lightsaber had. You know how much I love functionality. Lightsaber guy, by the way, may be Adam Driver’s character. I’m getting conflicting reports on who is actually doing the voice-over of the teaser. It sounds like a villain but no one seems to know. Some are saying that it’s Andy Serkis or Max von Sydow. Slashfilm says Serkis. Purely aesthetic, but I thought that the placement of the word “light” after “dark side” was pleasing. He sounded evil and seemed to only be talking about the dark side, only to turn out that he’s talking about both sides? Why? Does the light side bother him a lot or something? Is he losing sleep? It also brings back to mind the no-longer-canon, but brilliant, Knights of the Old Republic I and II, in which certain Jedi suggest that there are more shades of grey in the world than light and dark, or that the Force has a will of its own that goes beyond its Light and Dark sides. Black and white, good and evil. Will the movie stay within these confinements, or will it color outside the lines a little bit? Will there be any KotOR influence? I’m curious. Below is a link to a fake teaser. He’s right about one thing: you will not be spoiled by watching it! Lots of beautiful fan art here! Hey, I warned you. That link above also contains spoilers, but the VERY spoilery material is blacked out, so don’t highlight it if you don’t want to read it. Droids doubled as soccer balls. You could never get away with calling an out. They could see the line from their viewpoint.